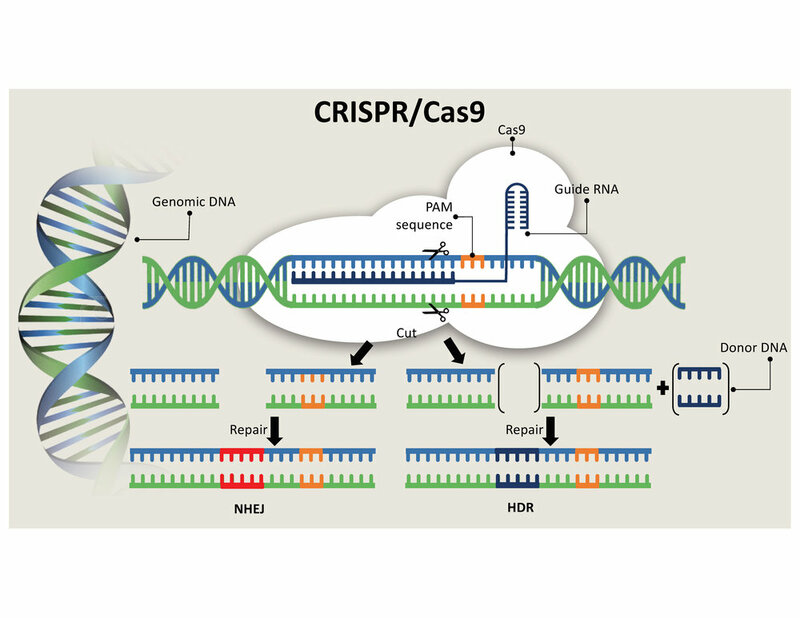 The CRISPR genome editing system requires a guide RNA (gRNA) and Cas9. gRNA is a short synthetic RNA guides Cas9 to the specific location in the genome sequence. The gRNA and Cas9 complex is like a pair of scissors that can cleave both strands of DNA upon recognition of particular DNA sequences. By simply redesigning the targeting sequence in the gRNA, we can change the genomic target of Cas9. After both strands are cut, the break is repaired by endogenous DNA repair mechanisms: non-homologous end joining (NHEJ) or homology-directed repair (HDR). HDR uses donor DNA containing a desired sequence resulting in the correction of a disease-causing mutation. Currently, the delivery of gRNA, Cas9 together with Donor DNA is a huge challenge. GenEdit has a proprietary technology enabling efficient HDR.